King Baudouin Stadium in 2012. 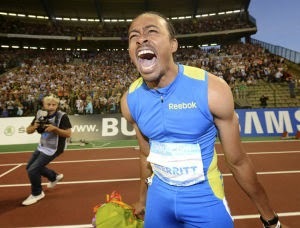 He prides himself on being humble, but even Aries Merritt knows what he did in 2012 was remarkable. “It was essentially the perfect year. I won every major championship that you can win that year. I broke almost every record you could break. I missed the Olympic meet record and the Olympic Trials record, but every other record I broke,” said Merritt, who is here this week for the Maximum Velocity Track & Field Camp at Centre College. Merritt won the Olympic gold medal and the World Indoor championship. He set a new world record of 12.80 seconds — shattering Dayron Robles' previous record of 12.87 set in 2008 — that still stands today. He ran the seven fastest times in the world in 2012 and his eight races under 13 seconds are the most ever in a single season. His 2013 season was not what he wanted because he tore his hamstring three times. “It was because I neglected to get the proper treatment. I thought it was just a little cramp, but it was more than that,” Merritt said. He tweaked his hamstring earlier this season, but said that injury is not why he’s at the camp and not competing somewhere else this week. “Even if I was at 100 percent, I still would have come because I promised Sharrieffa Barksdale that I would come here. I promised her I would a long time ago. Regardless of my health, I still was going to come,” Merritt said of his pledge to Barksdale, a former Olympian who attracts a bevvy of world class athletes to this event annually. Merritt said he rarely has time to work as a camp clinician because of preparation for world championships or the Olympics, but there are no major championships in 2014. “I am able to do a little bit more. I love doing camps and instructing kids and seeing them develop. It is a passion of mine and is something I want to do when I am done competing. I want to coach,” he said. He was a Georgia prep standout who went to the University of Tennessee and left after his junior season to turn pro with 14 total school, meet or facility records, including every high hurdles school record. He finished the 2006 college season undefeated in every 55-meter hurdles, 60-meter hurdles and 110-meter hurdles race he finished. In 2006, he broke the 24-year-old school record of Willie Gault and the SEC meet record (13.29) held by two-time Olympic silver medalist Terrence Trammell. Merritt won the 110 hurdles at the 2006 NCAA championships in 13.21 seconds, breaking Greg Foster’s NCAA meet record of 13.22 set in 1978. He credits coach Vince Anderson, who recruited him at Tennessee, for much of his success. Anderson left for Texas A&M and Merritt was also coached at Tennessee by Norbert Elliott, but it was Anderson who made him rethink his craft. “Vince Anderson paved the way for me. He pretty much told me everything I was doing was wrong in high school and that I needed to fix everything and that’s what I did. I forgot everything I had learned and I pretty much listened to what he said like it was Bible and everything he told me was true. It made me better and I live by those principles and continue to build off what he taught me,” Merritt, who credits much of his success to altering his approach to the first hurdle from eight to seven steps, said. Now he wants to help campers here the next few days, and he says there is no reason for any of them to be star-struck around him. He also wants to keep going. His first priority now is to win the Outdoor World’s Championship in Beijing next year. “In 2013 I tore my hamstring and was not able to compete at my best at worlds which cost me a championship. I missed three months of training and in this sport if you miss training it is so hard to catch up,” he said. “I was trying to my best but I just couldn’t get under 13 seconds. If I had run under 13, it would have sealed the deal. He keeps his Olympic gold medal in a safe at an Atlanta bank. “I carried it around for a long part of 2012 because everyone wants to see the medal. The 2012 medals were the biggest Olympic medals ever made. Normally they are small things, but these were huge medals and they are really heavy. They were so heavy on your neck, but that was a nice problem to have,” he joked. He calls himself a “Southern boy” who was raised with an outgoing personality. However, he is still a bit taken aback when anyone asks him what it is like to be the best in the world at his event. Perhaps that’s why he still remembers the attention his Olympic victory generated when he tried to leave the complex where the athletes stayed in London to go to a shopping mall “to just feel normal” after his race. “As soon as I won and stepped out of the village, I was mobbed by everybody. A lot of the people were sitting on the outside of the fence waiting on athletes to come out. They didn’t know who we were, but they just wanted autographs. They do that a lot in Europe. I walked out and hoped no one would recognize me and then all of a sudden everybody just comes and starts crowding me,” Merritt said.